Thrift store shopping is always fun. I haven't had much luck finding furniture at the thrift stores around here, but I try to keep my eyes open for little pieces that would enhance my home. Recently I was excited to find a beautiful silverplated pitcher that I knew would make a lovely vase for flowers. It was covered in tarnish, but I was sure that a little Wright's silver cream would fix that in a matter of minutes. And for $1, I figured I couldn't go wrong. 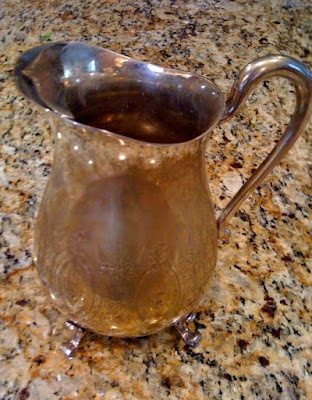 My darling pitcher was actually brass coated with a very thin plating of silver. Most of the tarnish came off with polishing--but so did most of the silverplate. Darn. Then I remembered how well metal takes spray paint. So I grabbed a handy can of Rustoleum's Heirloom White (I always keep this on hand; doesn't everyone?) and went to town. Doesn't she look graceful? Right now she's holding some grocery-store lilies, but I'm really looking forward to stuffing her with my blue hydrangeas in the summertime. If you have any old metal pieces that are beyond polishing or just don't appeal to you any more, try spray-painting them. Works like a charm! It's GORGEOUS! I love this idea. I have an old, inexpensive set I'm going to try this out on. Thanks for the inspiration! Love it, so fresh ! Oh, that turned out beautiful!! Love it!!!! Perfection, Richella. :) You took a lemon and made lemonade. That would make a great post as a "Solution" for the next Decorating Dilemmas party. WOW! I love it in white. Accidental finds can turn into the most beautiful treasures! Stopping by from SITS today! Love the pitcher. Makes me want to go thrifting. Have a blessed day! Of course, in the future, the baking soda and hot water on a piece of foil will detarnish anything that might be of questionable silver-content. Are you kidding me?? I didn't know...I'll be spraying away. Thanks for the tip! That looks beautiful! The white paint was a good choice, because it looks so clean. Looks great! I am looking forward to getting out in the warm weather and doing some spray painting, myself! 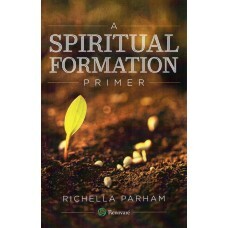 Stop by my blog... I am having a giveway for my 100th post!! Blessings! Beautiful!!! What a great idea! Very pretty! I like how you distressed the finish too. So pretty, Richella! I was just wondering what to do with a little silverplate tray I got thrifting. It's in good shape except for a little rust spot. Well... that's interessting but frankly i have a hard time figuring it... wonder how others think about this.. I love the Heirloom white. Very pretty, indeed!